CIOCCOLATERIA RAVERA in Cherasco in the province of Cuneo offers this mouth-watering speciality. 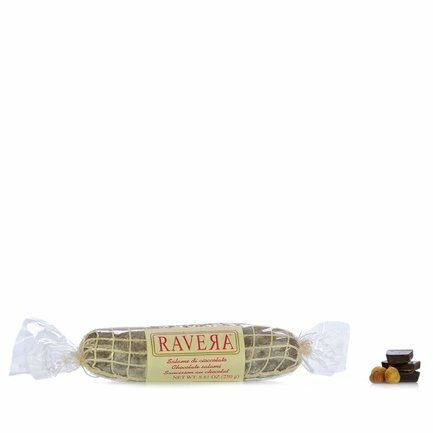 Cherasco chocolate salami resembles a normal cured pork sausage but it's made of extra dark chocolate with Piedmont IGP hazelnuts and sugar. Ingredients Piemont-Haselnüsse IGP Haselnüsse Tonda Gentile Trilobata, Zucker, Kakaopaste, Kakaobutter, Emulgator: Sojalecithin, Aromastoffe. ALLERGENE: Kann Spuren von Milch enthalten. For more information on product labels, please contact our Customer Service department. The information on the labels of the products may vary for reasons beyond our control, therefore, there may be discrepancies between the information on the site and that on the products delivered. Please always check the information on the product before consumption or use.